Harr y Clarke, Ireland’s most famous stained glass Artist, was commissioned by the Irish Government to design a window for the International Labour Office in Geneva. 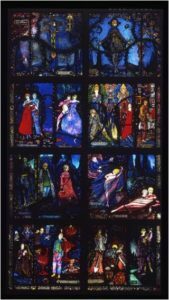 It represents the Irish Literary Revival and portrays poems plays and novels, chosen by Harry Clarke and WB Yeats. The final window was rejected by the Government and was never installed.